The Jungles of Chult campaign has been extended to bring players into The Lost City of Omu. A once prosperous and powerful society now a mere memory amongst the ruins. The nine Trickster Gods were worshipped heavily in this region and their shrines, hidden within the undercity, may still hold a bit of the power the gods once bestowed upon their worshippers. Dinosaurs will be a familiar sight from the time exploring the Soshenstar River Basin, along with Lizardfolk, Thayans, and powerful Gorillas. Another primal adventure awaits! Sending the players deeper into Chult meant it was time to expand the Jungles of Chult campaign to cover all of the exciting adventures awaiting in the Lost City of Omu. 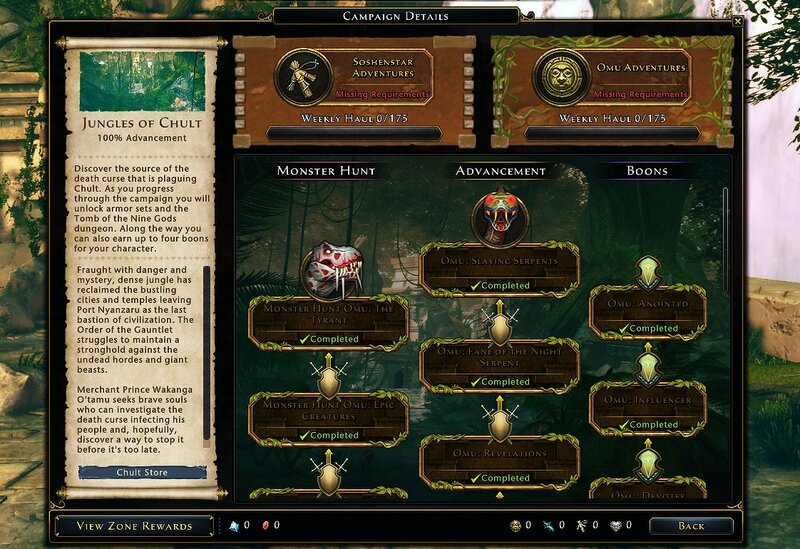 Repeatable Tasks – Like the Soshenstar area for the Jungles of Chult, players will be free to choose when to complete their tasks for the week. The Lost City of Omu has its own weekly haul and its own set of adventures to advance the campaign. But before you can dive into the ancient ruins of Omu, you must finish up the main path on the Jungles of Chult campaign for Soshenstar. Boons – The Lost City of Omu brings forth new boon points for the Jungles of Chult campaign. That means 3 additional points for the first tier of boons and 1 additional point for the second tier of boons, all of which can now have 2 points spent per boon. 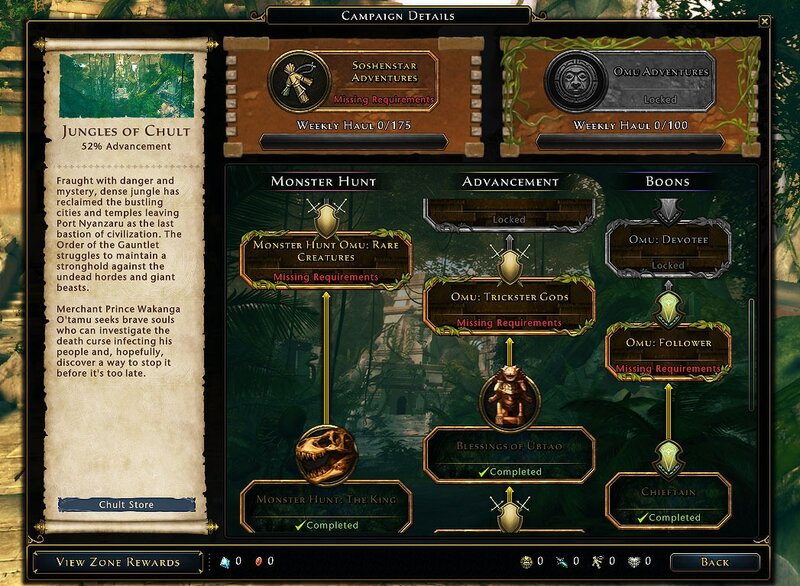 Rewards – To fill out the campaign rewards in Jungles of Chult release, players can now work towards Artifact Gear for their main and off hands as well as a new set of Pants and Shirt which have a body paint appearance. Exploring the ruins of the Lost City of Omu to discover the source of the death curse plaguing the lands will allow you entry into the Cradle of the Death God, a brand new trial which will require solid teamwork and daring adventurers to succeed. We look forward to welcoming all of you to the wonders of the Lost City of Omu, and can’t wait for you to discover the awe inspiring conclusion to this chapter of Neverwinter!